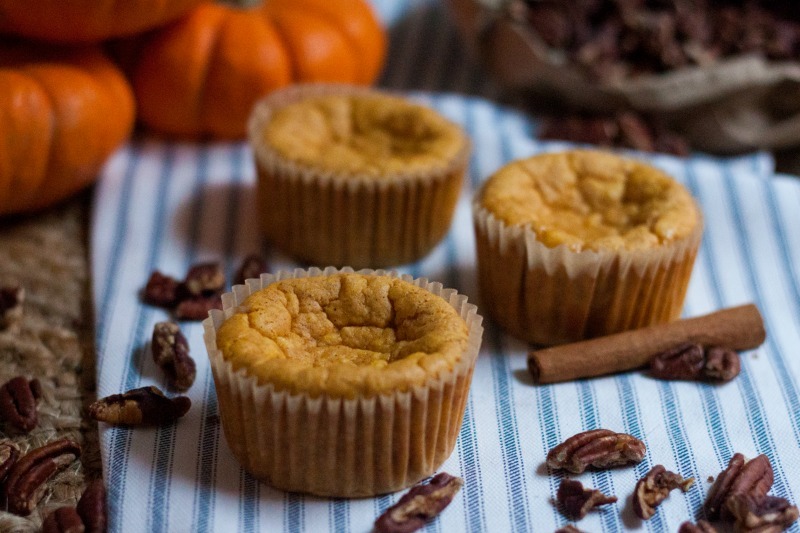 My Mini Keto Pumpkin Cheesecake Recipe is going to be your new favorite this holiday season! Pumpkin everything is always a must, but staying ketogenic is hard. This recipe is a perfect option. It’s delicious, easy, and sure to please anyone who loves cheesecake or pumpkin. 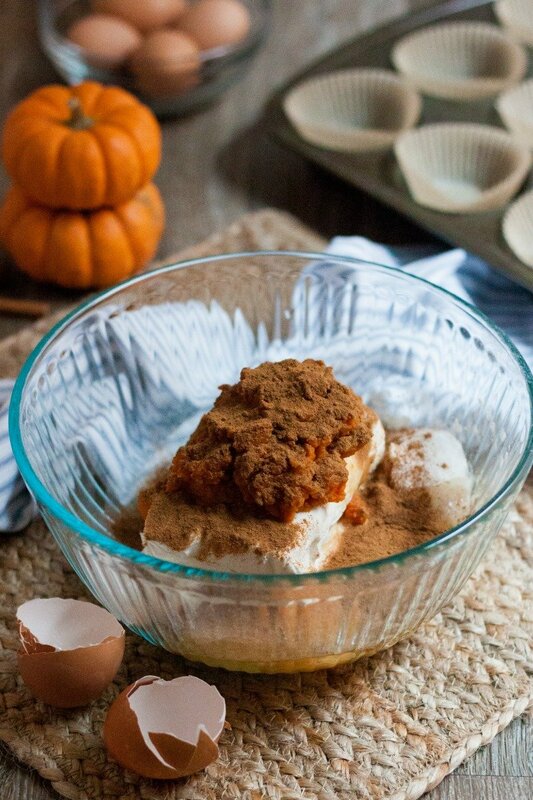 My husband loves everything pumpkin so I’ve been trying to come up with pumpkin desserts that are keto friendly that we can enjoy. 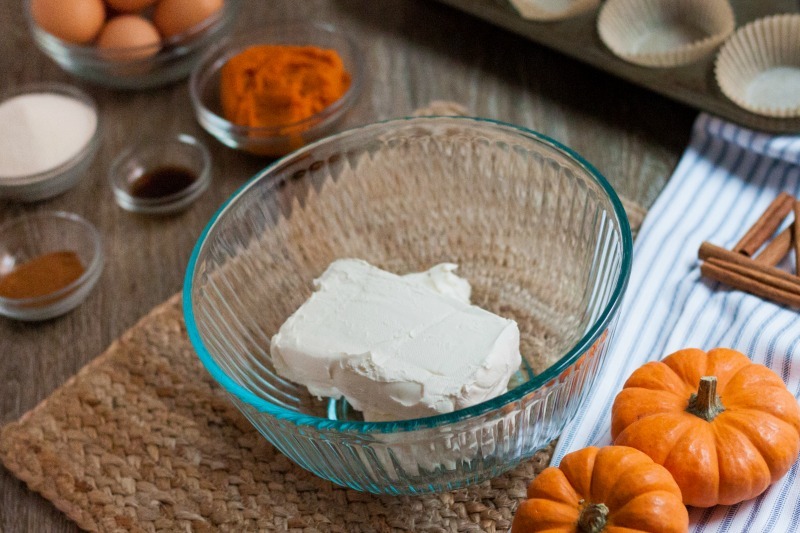 First, I made Pumpkin Fluff a couple of weeks ago, and it was a total hit. As I’ve been thinking about what to make next, I thought about how I might transform my Mini Cheesecakes into Mini Pumpkin Cheesecakes. Of course, I never know if a recipe is going to turn out on the first try. I was hoping that all of the modifications that I made would work as I wasn’t sure exactly how much pumpkin puree to add. I was pleasantly surprised that my Mini Pumpkin Cheesecakes turned out so good on the first try. It was a nice treat after dinner tonight that the entire family enjoyed. I added some chopped roasted pecans to mine, and it made it even better. 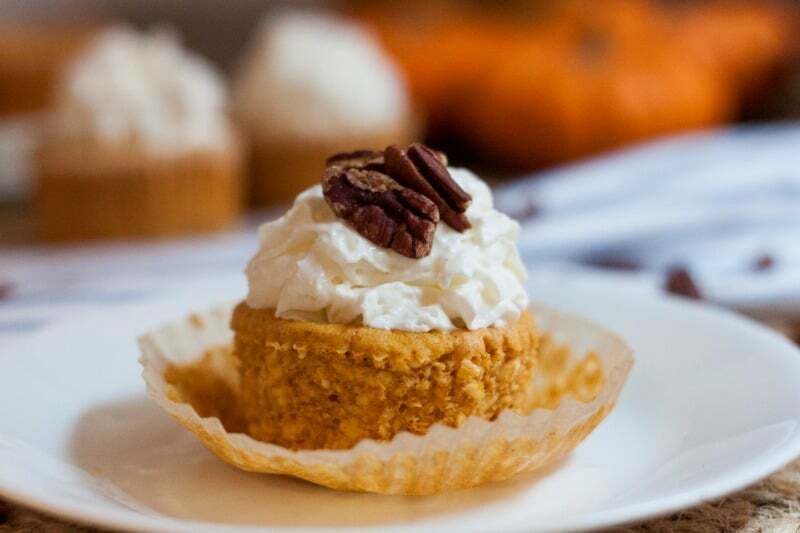 Mini Keto Pumpkin Cheesecake is the perfect holiday dessert option. Mini Low Carb Pumpkin Cheesecake is so easy to make with only five ingredients. Make sure that you soften the cream cheese so that it mixes completely smooth with the other ingredients. If you aren’t sure if it is soft enough, feel free to beat it first with the mixer on medium/high speed. I highly suggest using parchment paper muffin liners with keto or low carb baking. I have found that traditional muffin liners don’t work as well because keto baked goods tend to stick to them. You can grab parchment paper muffin liners on Amazon and have them shipped straight to your door. This is what I use. Don’t they look amazing? Make sure to refrigerate the Mini Low Carb Pumpkin Muffins first as they taste better chilled. You can eat as is without any toppings if you prefer. I prefer to eat them with homemade whipping topping and a few toasted pecans. 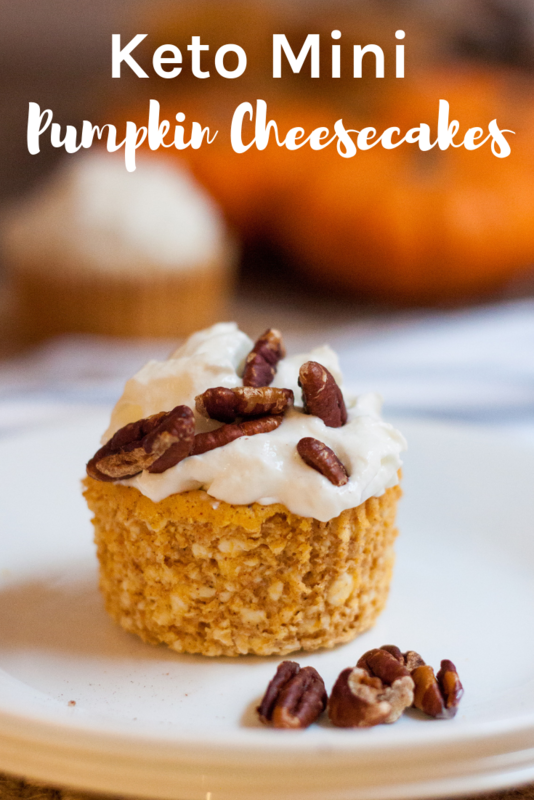 These Mini Keto Pumpkin Cheesecakes are delicious, easy, and sure to please anyone who loves cheesecake or pumpkin. Soften cream cheese in the microwave. Add all other ingredients to cream cheese and mix on medium/high until completely smooth. Bake for 18 - 20 minutes or until a knife inserted in the center comes out clean. Best served cold with a dollop of homemade whipped topping. 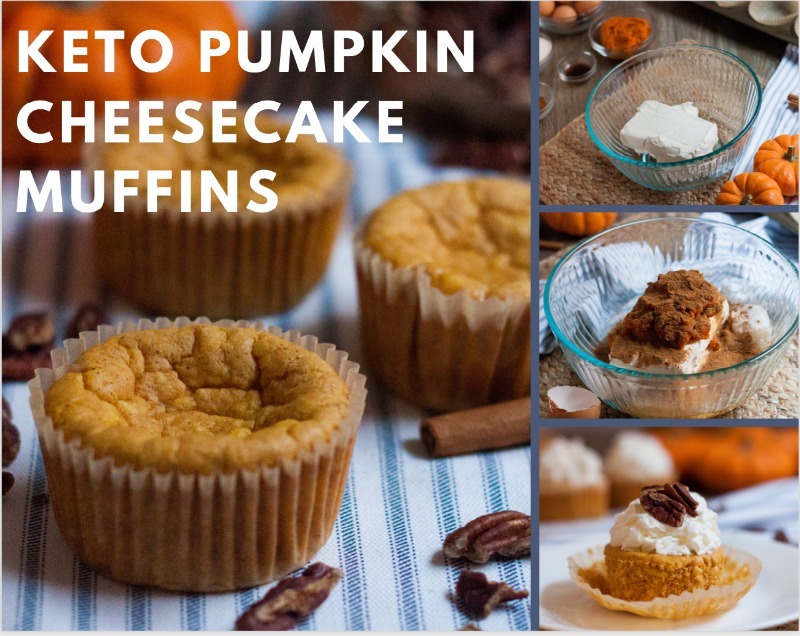 The nutritional info provided is based on making 12 Mini Keto Pumpkin Cheesecakes in regular muffin tins. The sugar alcohols from Monkfruit are not included in the nutritional information since most subtract to reach net carbs. 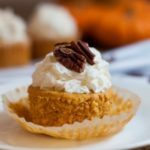 Keto Pumpkin Cheesecake makes a tasty and delicious dessert, snack, or even a twist on the traditional breakfast. 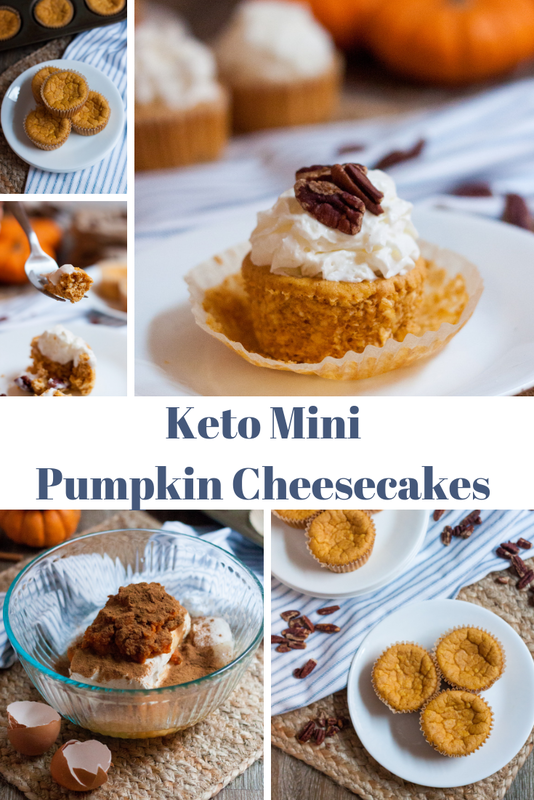 Mini Keto Pumpkin Cheesecakes are a real crowd pleaser for keto and non-keto folks alike. If you have been around here for long, you already know I love desserts! You’ll want to make sure to check out all of my Keto Recipes in my Keto Recipe Index. You may also be interested in testing out my favorites listed below! What is the serving size? Just one? The nutritional information is listed per cheesecake. Today is the first day of fall and this recipe was perfect to celebrate the changing of the seasons. Thank you for all your hard work in posting and researching these recipes. Thank you so much for taking the time to comment. I appreciate your kindness and support. These are amazing! Saturday morning breakfast with a dollop of fresh whipped cream made me feel like it was a holiday breakfast! I love it for breakfast too! Glad you enjoyed it! 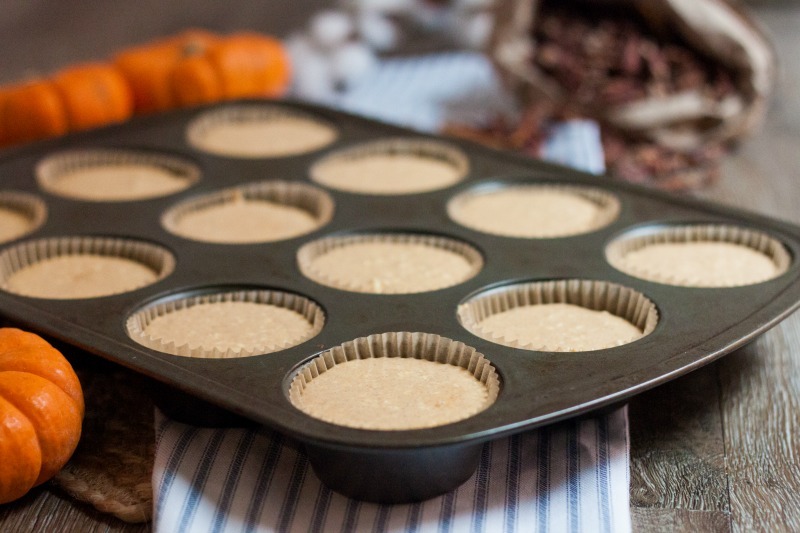 Do we use a mini muffin pan? You can use a mini if you’d like. I used a regular muffin pan. Do you use confectioners swerve for this or granulated? I used granulated, but confectioners would prob work too..
Could I use honey for the sweetener? I’m not a fan of the other stuff. You can add whatever kind of sweetener you would like, however, I can’t speak from experience if it will work and of course it alters the carbs. I’m not sure. We always eat them all. I haven’t. We always eat them all. I’m so glad I found you!! Your recipes are so simple and uncomplicated!! Started Keto in May and have been doing well. Do you think it would work to halve this recipe? Thanks so much for your kind words. I really appreciate it. Sure! I think it would work just fine. Are your dishes Johnson Brothers Richmond White? They are! I got them as wedding shower gifts over 20 years ago! I’m so excited to try these for Thanksgiving! You are, by far, my very favorite keto/deal guru!! Thank you! Ps We should be besties! ? Is Swerve available in the grocery store if not can you use Stevia or another sweetner in place of Swerve? Amazing… It can be the perfect dessert for this coming christmas.